a handbook for self-transformation and personal growth. in 'Soul & Spirit' magazine's Spiritual Book Awards for 2018. "This is an excellent book with real wow-factor - it's the sort of book you don't want to put down as it's so enlightening. It is so inspiring and is definitely a 'must-have' book - it has so much content that can help readers and introduce them to all-things archangels. I really enjoyed it and found it a pleasure to dip into. I would certainly recommend it for beginners as a starting point if they are just discovering angels, to help them grow and develop their intuition. 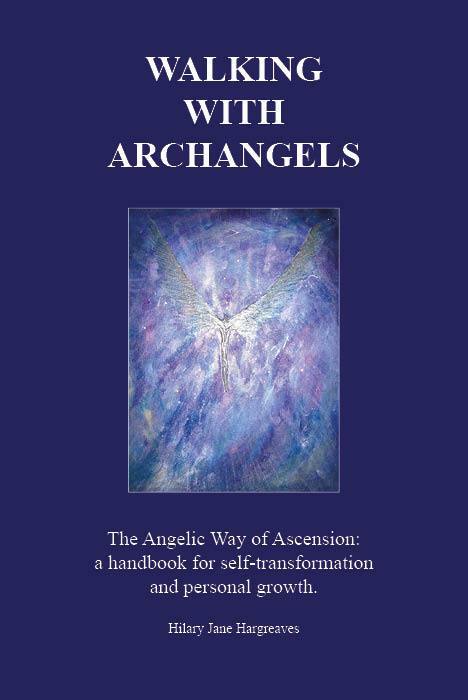 There's guidance on how to connect, and which archangel to call upon, as well as useful meditations that you can use to practise what you have learned, and incorporate it into your everyday life. This is a very good reference book and can be used as guidance for anyone. A brilliant read!" I have to say that it is an odd feeling to see your work 'in the flesh' for the first time. When I opened my copy for a first look and began to read it through I was amazed at how good it looked (kudos to Mark and all his formatting skills); and was truly taken aback by the breadth and depth of the contents - even to the point of wondering who wrote it (!) despite having read and re-read all the material dozens of times during all my numerous re-writes and edits. So, thank you, to all my Archangelic mentors and friends - and to ALL those who have kept the faith, and believed I could do it! Ay-oop Metatron! The Eagle has (finally) landed. WALKING WITH ARCHANGELS is an award-winning 400+ page hardback book (17 x 24 x 3.5 cm) crammed with completely new and unique information, comprising channelled teachings and wisdoms given by 26 Archangels and Archeia (78 Teachings in all); 78 Crystal Champions; 78 Creature Companions and 52 Greenwood Guardians. If you are interested in working with Archangels, Archeia, Crystals, Animal Spirit Guides and/or Tree Spirit Guides, then this book should be on your bookshelf! It has been beautifully designed and presented, and has a laminated full-colour cover (illustrated with paintings by Alison Knox), a sewn and glued reinforced spine, and an integral gold ribbon bookmark to make keeping your place easy! "We are the Illumined Host known as Unity Consciousness. 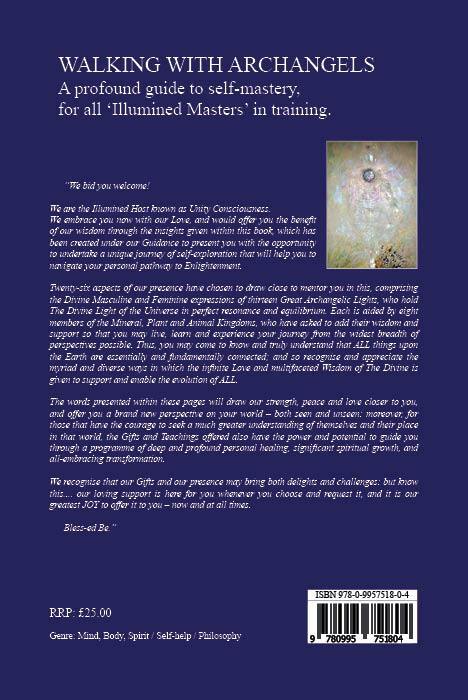 We embrace you now with our Love and offer you the benefit of our wisdom through the insights given within this book, which has been created under our Guidance to present you with the opportunity to undertake a unique journey of self-exploration that will help you to navigate your personal pathway to Enlightenment. Twenty-six aspects of our presence have chosen to draw close to mentor you in this, comprising The Divine Masculine and Feminine expressions of thirteen Great Archangelic Lights, who hold the Divine Light of the Universe in perfect resonance and equilibrium. Each is aided by eight members of the Mineral, Plant and Animal Kingdoms who have asked to add their wisdom and support, so that you may live, learn and experience your journey from the widest breadth of perspectives possible. Thus, you may come to know and truly understand that ALL things upon the Earth are essentially and fundamentally connected, and so recognise and appreciate the myriad and diverse ways in which the infinite Love and multifaceted Wisdom of The Divine is given to support and enable the evolution of ALL. The words presented within these pages will draw our strength, peace and love closer to you, and offer you a brand new perspective on your world – both seen and unseen: moreover, for those that have the courage to seek a much greater understanding of themselves and their place in that world, the Gifts and Teachings offered also have the power and potential to guide you through a programme of deep and profound personal healing, significant spiritual growth, and all-embracing transformation. We recognise that our Gifts and our presence may bring both delights and challenges: but know this.... our loving support is here for you whenever you choose and request it, and it is our greatest JOY to offer it to you – now and at all times." The Theme of their three Teachings ['The'... ] – one of which includes a Gift ['The Gift of... ] . The Gift of The Amethyst Flame of Transformation; The Spiral of Transformation – Perspective and Choice; The Sacred Purpose of Sigils, Symbols and Signs. Amethyst, Honey Calcite, Clear Selenite ..... Crab, Deer, Mouse ..... Aspen and Scots Pine. The Knowledge of Perfected Balance and The 'I' of The Pearl; The Knowledge of Perfected Creation and The Songs of the Whales; The Gift of The Pearl-white Flame of Hope. Pearl, Fire Opal, Rainbow Moonstone ..... Stork, Whale, White Dove ..... Linden (Lime) and Magnolia. The Obsidian Mirror – Truth, Trust and Transformation; The Diamond Lantern – Surrender, Sacrifice and Self-mastery; The Gift of The Merkaba of The Ascension. Black Obsidian, Clear Danburite, Moldavite ..... Dragonfly, Adder, Raven ..... Gingko Biloba and Corkscrew Hazel. The Gift of The Rose-pink Flame of Divine Compassion; The Sword of Divine Justice and the True Meaning of Power; The Blessing of Mercy and the Promise of Karmic Freedom. Rose Quartz, Rhodocrosite, Ruby ..... Turtledove, Horse, Dog ..... Birch and Cherry. The Crystal Ray and The Staff of Awakening; The New Dawn Flame and the Baptism of Fire; The Gift of The Crystal-clear Flame of First Consciousness. Herkimer Diamond, Lapis Lazuli, White Selenite (Satin Spar) ..... Honeybee, Golden Pheasant, Griffon ..... Hornbeam and Horse Chestnut. The Book of Illumined Truths and The Waters of The Diamond Light; The Flame of Truth and Light and The Serpents of Creation; The Gift of The Quill of Quetzalcoatl. Clear Apophyllite, Blue Celestite, Bronzite ..... Black Jaguar, Cicada, Golden Eagle ..... Tamarisk and Oak. The Fundamental Forces of Air and Water; The Fundamental Forces of Earth and Fire; The Gift of The White Light of The Alpha and Omega. Aquamarine, Tibetan (Black) Tektite, Snow (White) Quartz ..... Condor, Mountain Goat, Polar Bear ..... Rowan and Date Palm. The Gift of The Golden-yellow Flame of Illumined Wisdom; The Circle of Learning – the Jasmine and the Rose; The Secret Garden and The Gold Flame of Joy. Heat-treated Citrine, White Phantom Quartz, Ametrine ..... Locust, Kestrel, Wolf ..... Sweet Chestnut and Bamboo. The Grounding of The Christ-Light through the Cedar and the Rose; The Gift of The Yellow Flame of Divine Wisdom; The Art of Balance through Focused Self-awareness. Tiger Iron, Natural Citrine, Tree Agate ..... Egret, Jaguar, Tree Creeper ..... Pomegranate and Fig. The Merciful Freedom of Living in The NOW; The Fearless Heart and The Glory of The Grail; The Gift of The Magdalene Flame of Innocence, Purity and Love. White Moonstone, White Girasol, Aqua Aura Quartz ..... Butterfly, Ocelot, Firebird ..... Hawthorn and Eucalyptus. The Emerald Key of Modification and Balance; The Evolution of Life and the Perfection of Divine Creation; The Gift of The Infinity Cross of Multidimensional Reality. Seraphinite, Scolecite, Turquoise ..... White Eagle, Puffin, Hummingbird ..... Baobab and Yew. The Light of The Star of Venus and The Beauty Within; The Rose of Peace and The Dynamic Duality of Absolute Balance; The Gift of The Mirror of The Soul. Angelite, Malachite, Carnelian ..... Chameleon, Glow-worm, Great Grey Owl ..... Apple and Rowan. The Power of the Rainbow and The Light Within; The Gift of The Lightning Bolt of Divine Inspiration; The Star-borne Hammer of Dissolution and Creation. Flame Aura Quartz, Yellow Jasper, Haematoid Quartz ..... Peacock, Lion, Donkey ..... Chile Pine (Monkey Puzzle Tree) and Redwood. The Light of The Sun and The Sword of Truth; The Unicorns of Ultimate Purity and The Spiral of Contemplation; The Gift of The Sapphire Flame of Divine Expression. Indigo Kyanite, Sodalite, Blue Sapphire ..... Snow Leopard, Praying Mantis, Crow ..... Holly and Larch. The Circle of Life – the Labyrinth and the Maze; The Holographic Universe and the Multifaceted Nature of Divine Truth; The Gift of The Blue Flame of Divine Will and Power. Labradorite, Azurite, Blue Chalcedony ..... Tiger, Cobra, Bat ..... Myrrh and Weeping Willow. The Ray of Revelation and The Mind of The Divine; The Gift of The Golden Halo of Universal Awareness; The Magenta Ray and The Cosmic Seeds of Light. Cobalt Aura Quartz, Pyrite, Chrysanthemum Stone ..... Otter, Scarab Beetle, Skunk ..... Wych Hazel and Elm. The 'Tao' of the Open and Balanced Heart; The Seal of Embedded Creation and The Dragons of the Rainbow Realm; The Gift of The Rainbow Key of Light. Morganite, Preseli Bluestone, Rainbow (Angel / Opal) Aura Quartz ..... Snowy Owl, Rose Dragon, White Stag ..... Sycomore Fig and Mimosa. The Key to Wholeness and Health – Self-awareness and Love; The Mastery of Balance through the Still-point Within; The Gift of The Enlightened Lotus of Divinity. Pink Optical Calcite, Green Aventurine, Watermelon Tourmaline ..... Little Owl, Green Woodpecker, Hornet ..... Yew and Maple. The Knowledge and Wisdom of The Ancient Ones; The Book of Ratziel – Love, Light and The Word; The Gift of The Black Light of The Alpha and Omega. Apache Tear, Snowflake Obsidian, Jet ..... Cheetah, Ostrich, Elephant ..... Maple and Acacia. The Alignment of The Lotus of the Heart with the Linear Bodies; The Alignment of the Heart of the Lotus with the Unified Body; The Gift of The Sacred Seeds of Limitless Potential. Petrified (Fossilised) Wood, Tourmalinated Quartz, Gaia (Polychrome) Jasper ..... Turtle, Crane, White Peacock ..... Oak and Coconut. The Lyre of Light and The Charitable Heart; The Healing Power of Love Without Limits; The Gift of The Pink Flame of Divine Love. Clear Optical Calcite, Prehnite, Pink Girasol ..... Merlin, Wren, Lovebird ..... Poplar and Ash. The Gift of The Holon of Universal Balance; The Diamond Light that IS Within and Without; The Light of Universal Consciousness and The Holon of Infinity. Hematite, Zircon, Magnesite ..... Dolphin, Magpie, Cat ..... Juniper and Amelanchier (Snowy Mespil). The Gift of The Absolute Light of The Illumined Heart; The Crucible and The Alchemy of The Silver-Violet Flame; The Tau Key of Perfected Manifestation. Tiger Eye, Charoite, Blue Lace Agate ..... Squirrel, Rabbit, Mountain Lion ..... Robinia (False Acacia) and Beech. The Violet Ray and The Cloak of Immaculate Illumination; The Gift of The Violet Flame of Transmutation; The All-seeing Eye and The Communion of The Grail. Sugilite, Lepidolite, Golden Labradorite ..... Jay, Vulture, Goose ..... Larch and Tamarisk. The Alignment of Personal Will and Divine Will; The Gift of The Spear of Divine Enlightenment; The Enlightenment of The Platinum Star of Illumined Truth. Hawks (Falcons / Blue Tiger) Eye, Rainbow Obsidian, Clear Quartz ..... Peregrine Falcon, Octopus, Sparrow ..... Cypress and Baobab. The Sacred Flames of Resurrection and Rebirth; The Keys of Understanding and The Scroll of Akasha; The Gift of The Divine Templates of Creation. Amber, Green Jade, Red Jasper ..... Phoenix, Swan, Spider ..... Mulberry and Sycamore.